In the mid-nineties, Aronofsky wrote down ten film ideas he wanted to pursue. All six of his films have come from that list. That is amazing. Martin Scorsese doesn't have that freedom and conviction—like most directors, his projects are less about a lifelong drive to get them made than a question of what he can get financed. (Not to say Scorsese isn't passionate about his work, of course; it's just that they aren't necessarily Passion Projects anymore.) Clint Eastwood and Woody Allen have that sort of freedom, but neither can work up the passion to do more than a few takes anymore. Certain ultra-indie directors only get to do their personal projects — Jim Jarmusch, your average mumblecore Portland sort — but on such a small budget that their movies can't help but be somewhat compromised. Even legends like the Coen brothers and Quentin Tarantino can't work entirely outside the zeitgeist. But Aronofsky sat down 20 years ago and said, "I'm gonna make these 10 films that I want to make, the way I want to make them." He has now gotten through six of them. That is just flabbergasting. It requires a laser focus and an iron will to pull off something like that — and to make the combined result a huge financial success, too. After the fiasco of 2006's The Fountain, he has made 2008's The Wrestler, which garnered Mickey Rourke his first Oscar nomination, and Black Swan, which was the most financially successful film (relative to cost) of 2010. 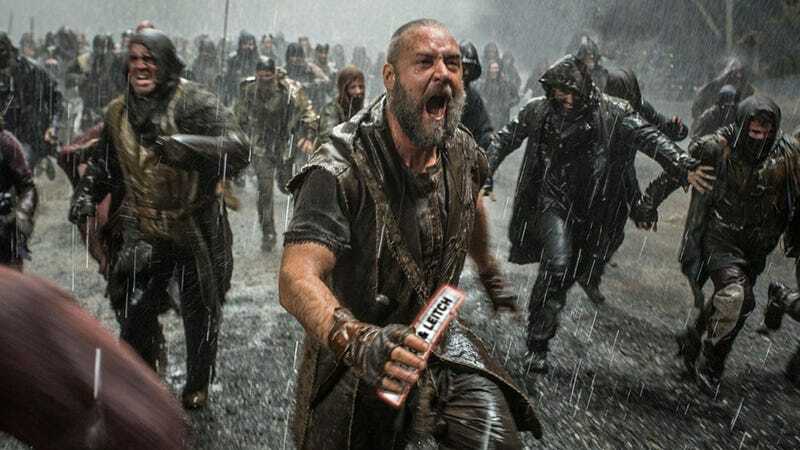 But his biggest hit, as it turns out, is Noah, his massive, controversial, much fussed-over Biblical epic that Paramount attempted to wrest from his control for months, to no avail. It opened this weekend to a huge $45 million gross, setting it up to be, by far, the biggest hit of Aronofsky's career. It's also a critical success, which means he stared down a major studio, won, and then delivered a film that wowed critics and brought in a ton of cash. That's the auteur trifecta right there: That's beating the system. I should be so happy for him, my favorite director. But I can't be. Because I'm pretty sure his movie is terrible. All right, "terrible" is too strong, sorry. Noah has plenty to offer, from a powerful lead performance by Russell Crowe as a man, like all of Aronofsky's protagonists (and of course like the director himself), of overwhelming conviction, willing to lose himself and everything he cares about for the cause he most believes in. (It is undeniably to Aronofsky's credit that you spend half his movie about one of the Bible's most famous figures wanting to kill that famous figure.) And it looks fantastic, as you'd expect—it has the muddy, ruddy beauty you would expect from a stylist of this caliber. But the fact that everyone roots for Aronofsky is obscuring the fact that his movie is a total mess. While it's commendable that he insists on taking this incredibly silly Biblical story — the animals go in by twoseys-twoseys! — with the utmost seriousness, it doesn't make what we see onscreen any less silly. The first half of the film, as Noah builds his ark (using all sorts of homemade pulleys and fulcrums impressively sturdy enough to withstand the apocalypse) and all the animals come in from around the world, is pretty ridiculous, and it's not helped by some truly subpar special effects. (Aronofsky is obviously not comfortable with the world of CGI, and many of the early set pieces recall the computer-fill-in deck people that now make Titanic look dated.) The movie clicks along at a reasonable pace, but it never feels like it's going anywhere: Aronofsky just assumes we share his passion for this Biblical story, even if we don't. It also doesn't help that the driving force of the story involves Noah's three sons, all of whom are, well, sorta dead on arrival. One is the perfect son; one is the rebellious middle child; one is young and mop-haired and cute. Aronofsky's belief that we're going to care about this sibling rivalry, and how they deal with their zealot father, far exceeds the audience's, particularly when all three actors are duds. Actually, the whole cast outside of Crowe is dull as dirt. Anthony Hopkins plays another of his twinkly, impish gravitas machines — this time he's Methuselah, the logical conclusion of the last 10 years of his career. Jennifer Connelly appears actively bored as Noah's wife, Emma Watson does her best with nothing to do as Noah's adopted daughter, and Ray Winstone huffs and puffs to no avail as the evil descendant of that evil brother, Cain. Winstone is indicative of Aronofsky's larger difficulty in really digging deep into this material: He exists to personify, in snarling, Snidley Whiplash tones, the pompousness of man that Noah (and, presumably, our director) is attempting to eradicate. All Aronofsky can think to do to exemplify this vague concept—that man is the king of the beasts , and therefore God himself—is show Winstone playing a clichéd, apparently invincible supervillain with gnarled teeth. The only fleshed-out character is Noah himself, which makes sense, but makes the scenes that involve anyone else drag and plod. This all makes the big flood, when it comes, both too much and too little. It's an impressive set piece, but, as a nod to the people budgeting his film, Aronofsky turns it into a Lord of the Rings-type battle sequence, thanks to the Fallen Angels/Rock Monsters he's invented for the film. It's a crazy scene—because this Bible movie about Noah and giraffes and elephants and such all of a sudden has rock monsters punching rushing mobs of soldiers trying to escape the rain—but it's not particularly inspired; it has none of the scope or power of any of Peter Jackson's comparable scenes. It feels like a mandated battle that Aronofsky just wants out of the way so he can get down to what he really wants to do, which is to show Noah as an obsessive who is willing to murder his entire family and destroy the human race in order to prove that the visions he believes God is sending him are true prophecy. Aronofsky hasn't created a new world for us to explore; he hasn't recreated a Biblical moment; he hasn't reimagined a thousand-times-told story; he hasn't even given us good special effects. He has simply successfully convinced a major studio to give him millions of dollars for another film about human obsession (with a conservationist, and perhaps vegan, message tossed in for good measure). And it worked! People went to see it! It's his biggest hit. This is to be commended. I'm happy for him. But it doesn't mean he's made a good film. I'm pretty sure it means he just made his worst.